Today I'm announcing that there is concrete evidence proving beyond a shadow of a doubt that the creationists are wrong and Darwin had it right when he theorized that populations evolve over the course of generations through a process of natural selection. I saw it happen, not on some remote island or in a laboratory, but right there on my plate at dinner last night. 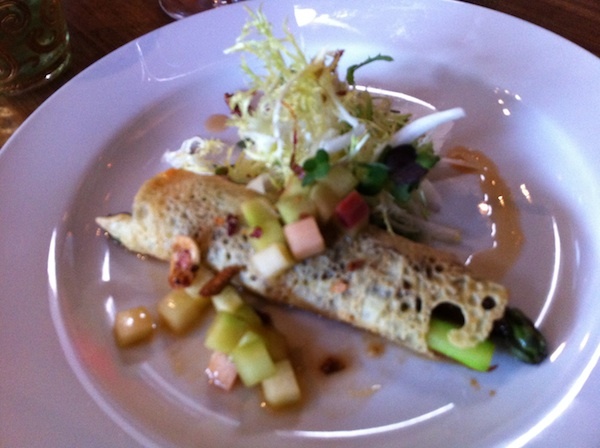 Asparagus and caramelized shallot crêpe with parsnip, rhubab compote and tangerine oil. 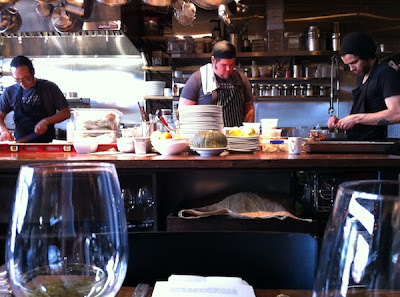 Chef Aaron Woo (at left in top photo), co-owner of Vita Café, the ever-so-crunchy natural foods restaurant on Alberta, had sterling creative credentials from places like San Francisco's Stars and Portland's ClarkLewis. But he was feeling constrained by the 70s-era mindset found in the vegetarian dining scene in Portland and longed for a challenge. Tabetha Warren at the bar cart I'm planning to steal. So he packed up and went to Greystone, the Culinary Institute of America's outpost in the Napa Valley, where he studied modern cuisine with Kyle Connaughton, chef at The Fat Duck in England and a devotee of modern as well as Japanese cuisine, and Aaron London, executive chef at Ubuntu, the Michelin-starred "vegetable" restaurant in Napa. 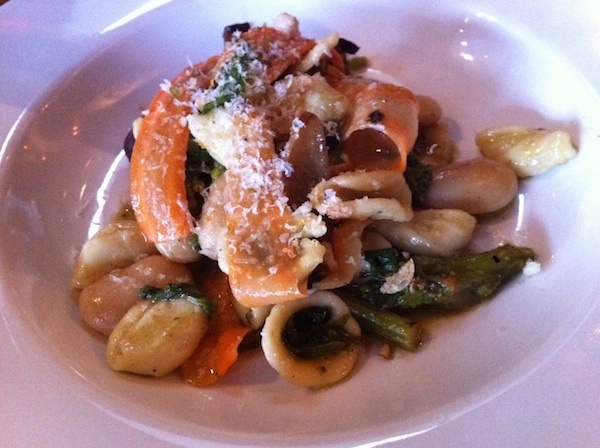 Rapini, corona beans and orecchiette with fennel, garlic, chiles and parmesan. The inspiration and experience he gained inspired Woo to open Natural Selection, a warm and inviting place where he could experiment with the modern techniques he'd learned and apply them to rustic European dishes. Its 30 or so seats surround what's basically a large kitchen island that fronts the stove and grill, giving every seat in the house a view of Woo at work. 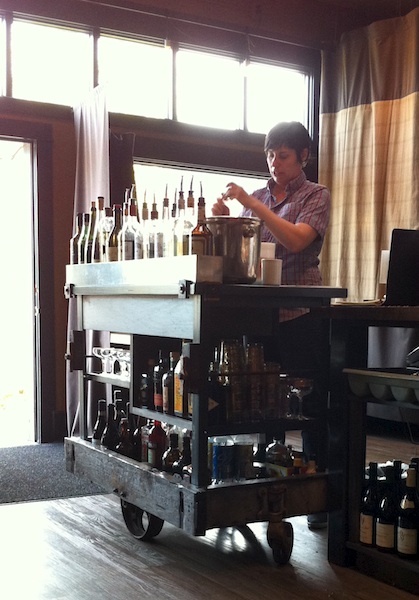 A fabulous industrial cart that would be the envy of any steam-punk-obsessed nerd serves as a bar cart. (Note: don't be surprised if it disappears and rematerializes in my dining room.) It's ably manned by talented mixologist Tabetha Warren, who creates the restaurant's signature cocktails with the same eye for ingredients that Woo brings to his kitchen. 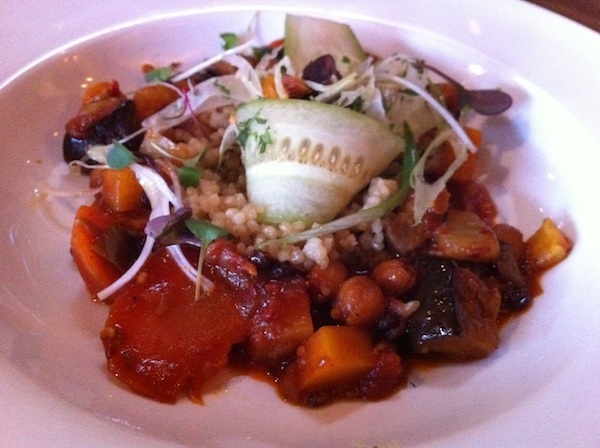 Moroccan spiced chickpea stew with almonds, harissa and couscous. With a prix fixe menu of four courses for $35, there are two choices for each course, including at least one gluten-free or vegan (or both) dish per course. Woo and his staff bend over the counter arranging each exquisitely plated leaf and smear, each composition offering a thoughtful balance of flavor, texture and color. 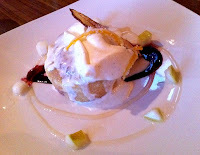 Brioche bread pudding with dried pear, huckleberry sauce and vanilla cream. The food is so good, as a matter of fact, that I hesitate to sully it with the baggage that goes along with the label "vegetarian," since even the most ardent carnivore isn't going to miss his ration of animal flesh after a meal here. And that's what I'd call a step forward in Portland's evolution. 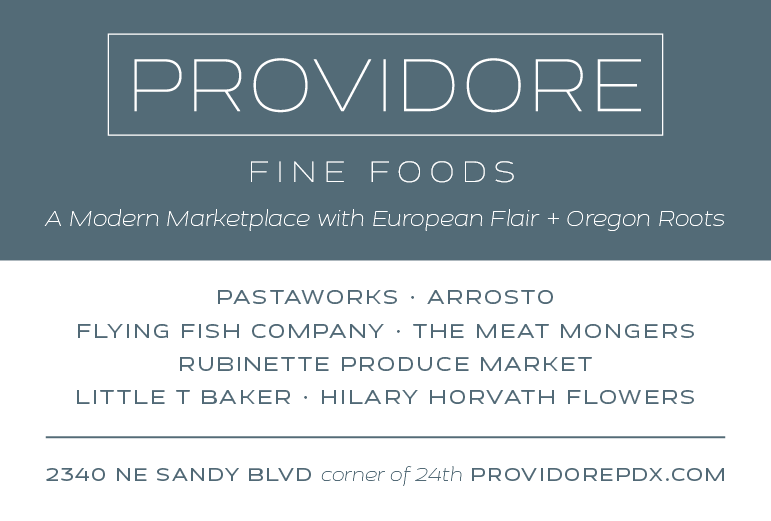 Details: Natural Selection, 3033 NE Alberta St. 503-288-5883.